DDB is hoping the Sumatran tiger doesn't go the way of the vinyl record—particularly the quickly degradable one. 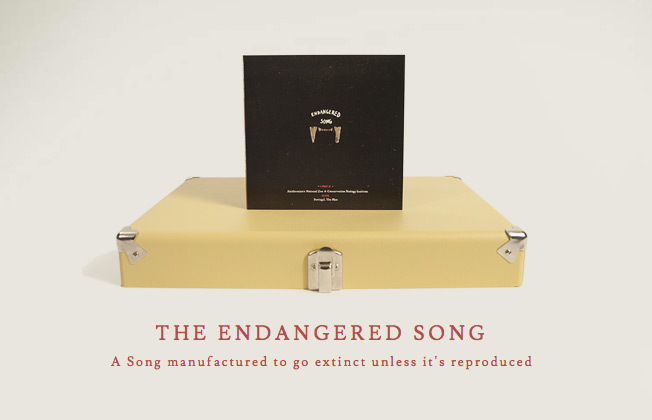 For Earth Day, DDB New York and the Smithsonian's National Zoological Park and Conservation Biology Institute are raising awareness of the endangered animal—of which only 400 are left—by creating an endangered song. For The Endandered Song Project, the agency got Atlantic Records band Portugal. The Man to write a new track simply called "Sumatran Tiger" and release it only on 400 lathe-cut vinyl records, which are designed to degrade after a certain number of plays (about 100 plays, we're told). The 400 people who got the record (we were one of them) are being asked to digitize the song, thus keeping it alive, and share it through social media using the hashtag #EndangeredSong. "We liked the idea that there is this degree of difficulty to the project in terms of what people had to do," Matt Eastwood, chief creative officer of DDB New York, tells AdFreak. "We are responding a little bit to the whole slacktivism thing. We want more than just a tweet. Of course we want that, too, but saving a species is more than just a Facebook like. You have to physically get involved and do things." DDB initially thought about releasing the song on a cassette. "Then we found out about the lathe-cut records," said Eastwood. "Records, too, are almost extinct these days. And the song will slowly become extinct if you don't copy it over to digital … It's very old school meets new school, which I like. It's old technology, but we're promoting it using the digital technology of Twitter and Instagram and Facebook." The Sumatran tiger was a somewhat arbitrary choice (there is no shortage of endangered species) but a compelling one, Eastwood added. "It's not an unusual animal, but it's a rare and exotic animal, and everyone loves tigers," Eastwood said. "There are only 400 of them, which to us just seemed so desperate. You could fit them in a car park. It's ridiculous." Portugal. The Man, whose members hail from Wasilla, Ala., and are committed to environmental causes, were happy to join the cause. The campaign doesn't have a specific call to action for donations, but you can contribute through a link on the campaign site. Various digital copies of the song have already popped up on Soundcloud, or you can check out our proudly low-fi version here.